If you got home the lemon tree, it is necessary to know how to properly care for it to ensure the optimum developmental conditions. Flowering lemon can occur several times a year, that it is possible to determine the correct care of a plant. In Russia, home breeding of citrus has more than three hundred years, since the first lemons in the Russian Empire were imported during the reign of Peter I. Lemon, in fact, is an evergreen plant that blooms several times a year. The flowers have a very pleasant smell, and the number lepeshkov is limited to 5 pieces. Bright yellow fruits originate mainly on the branches that are not below fourth level. The fruit appears on short twigs — plodushkah. The Mature fruit can two years remain on the branches of plants, changing first to green, then to yellow-gold. Potted lemon trees, in contrast to soil, have a thin rind. Despite the fact that such seed less lemons, they are much more aromatic. With proper care potted lemon trees will bloom and delight you with a harvest as trees from your garden. Care for potted lemon tree has a few differences from the care of a tree from the garden. One of the differences is flowering time. Most potted lemon trees bloom and produce fruit throughout the year. 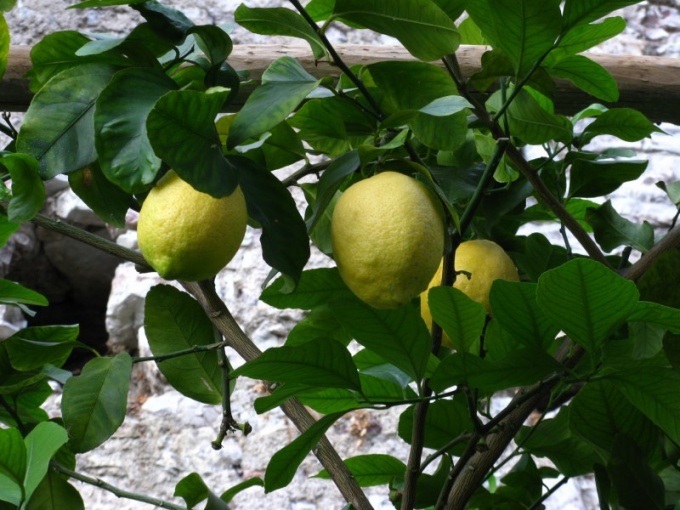 It is primarily for such varieties of lemon, as "Mayer" and "Lisbon". But if, for example, the lemon varieties Eureka" you are growing soft seaside climate, he, too, can bloom and bear fruit all year round. The flowers of lemon, as a rule, both sexes, located singly, in pairs or in small bunches, they are large, 4-5 cm in diameter. The period of Bud development lasts 5-6 weeks, followed by a flowering period: 7-9 weeks. The period of growth and development of fruit from ovary (petal fall) prior to ripening at room conditions during the spring flowering can last up to 230 days. In the summer the best coverage and optimum temperature, so the period of development of the fruit is reduced to 180-200 days. If in the first year of life of a young, newly grafted tree "throws" the flowers, they must be broken before they will bloom. This will allow the young plant to keep your strength and keep them for future proper development. The second flowering buds are not already removed. Often, the tree decides how much fruit it can "nurture" and how much he needs to lose the "extra" flowers. It is recommended to allow the flowering of lemon if it has at least 20 healthy leaves. Each time, the flowering period of the lemon tree, it is necessary to pay serious attention to watering. Lack of water can lead to blossom. Lemon tree in a pot needs watering, when dry the upper layers of the soil at 3-5 cm. You want the soil in the pot was always well hydrated.